A chilly but clear evening, this time of year it is dark on the way to work and the way home from work. Great capture! Love the composition and light! Nice shot, I would like to be on that plane and not in the building working. You packed a lot into this photo, the building, the plane, the moon, and the beautiful sky. Nice shot. You're such a smart photographer, Mo. This looks like the opening shot of a movie, the moon, the plane, the busy night work in the building. You can do a lot with Picasa but I still use Photoshop and Paint. There is so much going on here. Busy town in so many ways. I love the sad every day atmosphere. Thanks for the visit! Nice photo, love the contrast between the lights inside the building and the sky's color. That is really a great shot! The moon and building just perfectly frame the plane. One can feel the chill! Hi Mo, Great to catch up in London - you are so lucky to live there - great city!!! Thanks for popping by my blog. Hi Mo, This is a great night shot. I have such a problem trying to take night shots. It's great seeing the natural light of the moon above the artificially lighted building. We sure did love London. It was the first overseas trip that we took the kids and they still remember it. Perfect night shot..beautiful & look cool. Thanks for droping by my SW.
Really great nightshot. 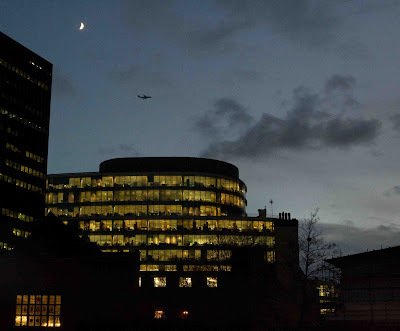 Lots going on from the building to the crescent moon and the plane too. Well done. I love photos taken at this time of the day, when the sky seems lit up and the lights are coming on. The airplane, the moon and the clouds really set the mood. Nice SkyWatch!